Through a variety of colors, shapes and styles, each Coudersport glass piece reflects the hopes and dreams of an optimistic era. Though the company was short-lived, the glass they produced was beautiful and its surviving examples are highly collectible. This is the one guide to Coudersport glass you will need. It starts off with the complete history, and then continues on to a stunning full-color section filled with examples that have descriptions in the back. Also included are catalog reprints, information on patterns, and a 2000 value guide. 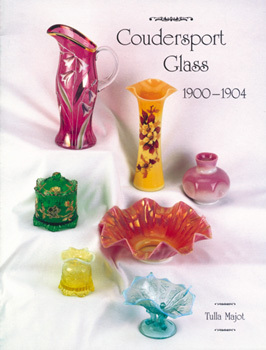 For any collector, dealer, or Coudersport glass enthusiast, this is the book for you.